It can be hard to get the reach you aim on Facebook. You might be posting content but not getting the engagement you want from your fans. Here are a few techniques that will help you grow your Facebook audience, organically and through targeted ads. No time to read this now ? With over 1.7 billion people on Facebook, you need to target the right audience to reach your customers. Facebook Ads Manager can help you connect to people who are likely to be interested in what your business offers with different tools. Here are four ways to target your audience. Give them a try to find the best performing solution for your own business. Location : target a location by adding a country, city or Zip code. Age : from 13 to any age, what age range do you want to appeal to? From teenagers to seniors, theses settings offer you flexibility to choose the best fitting audience. Gender : you can target a specific gender if your product only appeals to one gender for example. Languages : you can leave this blank unless the audience you are targeting uses a language that is not common to the location you have chosen above. This section allows you to choose the interests and hobbies of the people you want your advert to reach. From organic food to action films, you can target any interests directly related to your future customers. After adding a first interest, Facebook will recommend more categories, you can see them by clicking on “suggestions”. If you add more than one interest, you advert will target people you match at least one of the interests listed. You can target pretty much anything you want and get creative with settings like “Life Events”. You can also exclude some groups of people to narrow your audience and be sure to reach the exact profile you want to appeal to. To get more page likes : you will exclude people who already like you page to focus on new leads. To improve the reach of your posts : you will target your fans and their friends to increase the chance for them to share your content. To provide social proof : you should target friends of fans to add validity to your advert since people are more likely to perform an action (like a page, click a link, comment on a post, buy a product, etc.) if a friend did too. 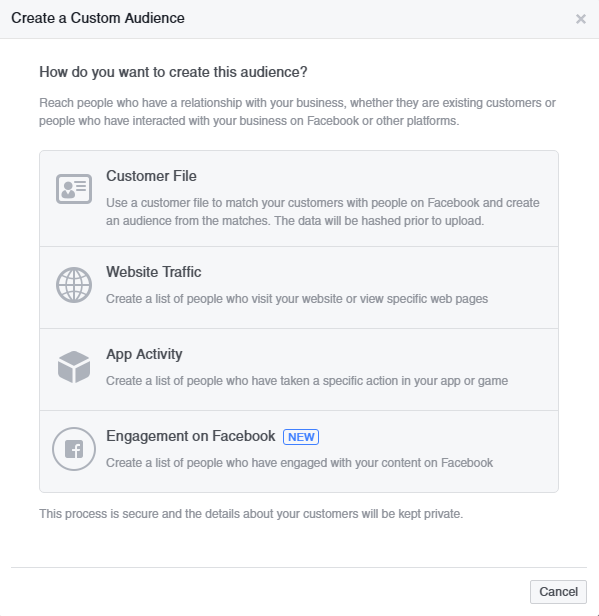 Custom audiences is quite powerful since it allows you to connect your external datas to your Facebook page with a simple .txt or .csv file. For example, you picked up phone numbers of people that might be interested in your product but don’t know how to use those online? With “custom audiences”, you can actually use those to reach those people on Facebook (when the phone numbers are linked to a Facebook profile). It’s the same with email addresses : a random mailing list can be uploaded to Facebook to create a custom audience! The custom audience setting is full of possibilities. Take a look at this article to see just how much you can do using this tool : 10 Creative (and Sneaky) Ways To Use Facebook Custom Audiences. You can often stumble upon infographics showing you what are the best times to share your posts but those can be misleading since they probably aren’t based on businesses like yours. They may have surveyed businesses that have a very different global reach from you or businesses targeting users within a different age group (with very different social media habits). In some cases, it would be quite hard to find advices for a business just like yours, you will always find average stats. A great way to optimize your posting times is to just ask Facebook. Facebook gathers lots of stats about your page’s audience and stores it in the “Insights” tab that you can find on your business page. Check when your fans are online to visualize what are peak-times. In this graph, you can see the peak-hour is 6pm so you might think it is a great time to post since more users will be online and able to see it. But according to Jon Loomer, this might not be the best strategy. He conducted an experiment to improve his reach and decided to try to post during non-peak times. The logic behind this experiment is that, at peak-times, your users will be drown in ads, you will be competing with a lot of businesses to get their attention, whereas at non-peak times, you will have more chance to reach them. His experiment was conclusive : links had more reach when posted during non-peak hours. No matter what strategy you choose to follow, keep in mind that infographics about the best times to post on social media might no be working for your business. By spending some time analyzing your business’ Insights tab, you will be able to create a custom posting schedule for your audience and improve your social media strategy. Ask questions : Involve your fans in your posts by asking them questions, asking them for their opinion. Show them that their voice matters and interact with them. Use images : Lots of studies have shown that images get more reach than link and status updates. Images speak to people and tell stories, plus, if you take time to add your brand logo to the picture you might get more exposure when your image is shared. Have fun with your fans : There are a popular games you can play with your audience. It is always fun to take a break from work and your fans will appreciate to take a few minutes engaging with you on a fun topic. Try a “fill the blank” or a “caption this picture” and see your audience’s response. Reply to comments : answer to every comment you get. Don’t let a fan hanging when he is trying to connect with you, otherwise they won’t see the point in interacting with you in the future. Use “transparency” : people like transparency. It means posting something personal and real to your fans : pictures of your team, personal strategies you use in your business or even revenue numbers. Those posts have more engagement because they feel real, more interesting to your audience and change from the usual content you share. Create a contest : creating a contest to reward your most loyal fans will increase your engagement. You can ask them to comment to enter the contest (by answering a question for example). Contests create excitement and will get your fans to come back on your page regularly to see if they won. Two other tips are to post content more often and to publish evergreen content on your page. See below why those tips will increase engagement on your page and help you grow your business. Always keep consistency in mind when trying to reach to an audience : you want your fans to be reminded of your brand everyday. You can’t post once a month then four times a day and then go back : an irregular posting schedule won’t keep your followers engaged. To do so, you can start slow by posting once a day and gradually increase your goal. A great way to keep up with your goal is to set up a posting schedule : plan in advance the content you want to share and use an automation tool to take care of your content distribution. Check this list of Social Media Tools to automate Content Distribution. In order to stay up in your fans’ Facebook feed, you need to provide fresh content, but your older content can also be perceived as recent if they are evergreen. An evergreen article is relevant on a longer period, therefore it has more chance to be shared, liked or commented than short-lived articles. This fresh engagement will put your content back in your fans feed and provide you with exposure with less efforts. In many ways evergreen content is very powerful and with a few very good evergreen posts, you can quickly increase your conversion rate. To apply this method though, you will need to follow how your content is performing and understand what content works best with your audience. Track your results with an online tool for better results. Bonus : skip to the end of this article to discover how to save time on reposting evergreen content and how to track your Facebook results with Repost by Elokenz. Have a well written “About” section on your business page and of course, don’t forget to add a link to your website. It might seem obvious, but I often go to an “about” page and find so little informations about the business, sometimes not even a link! Another “About” section you should fill in, is the one on your personal page. When you post a message or a comment on a Facebook group for example, people might wander on your profile so make it easy for them to know your business. Evergreen content will increase your page reach because of its longer lifetime. But with all the content you post, how will your fans notice your evergreen articles? The answer simple : you need to repost your evergreen content regularly! If the answer is simple, the method to do it can quicly become a time-consuming task. You can avoid wasting time and get more engagement on this content by using an automating tool such as Repost by Elokenz. Repost by Elokenz can increase your conversion rate through content with just a few clicks. Reposting your evergreen content for months or years might seem obvious but not everybody has time to do it and you are loosing potential leads by not doing it (even short -lived pieces can sometimes be reposted a few times). So, discover how Repost takes care of your evergreen content and create your account for free here. 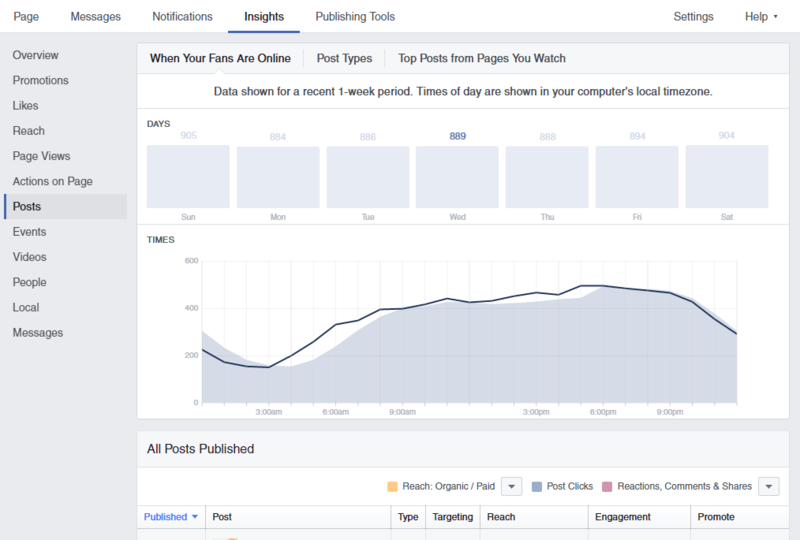 After analyzing your Facebook Insights tab, you can determine your strategy and create your posting schedule. Within this schedule, determine a few slots where you will repost your evergreen content, and then let Repost take care of it. In the Calendar tab of the tool, just set up the slots you chose for evergreen articles. The number of slots you choose to dedicate to evergreen content will depend on how much evergreen articles you have. With this method, you will optimize your reach with evergreen content, save time on the posting task, plus you will have a few less slots to fill on your regular calendar. With Repost, set up a few different statuses for each article, the tool will take of sharing your different messages each time it is reposted. We’ve all read about the pros and cons of automation. One of the biggest fears of using automation is definitely the fact that your users might get tired of seeing the same content over and over again. As I wrote before, writing different statuses is one solution to get your evergreen content posted in different ways, but you also want to be careful about your reposting frequency. In the Repost settings tab, the social fatigue panel is taking care of that : the social fatigue setting will determine how much time before your content can be shared again. If your social media strategy isn’t giving you results, switch to another one and keep experimenting until you find the right one for your business. 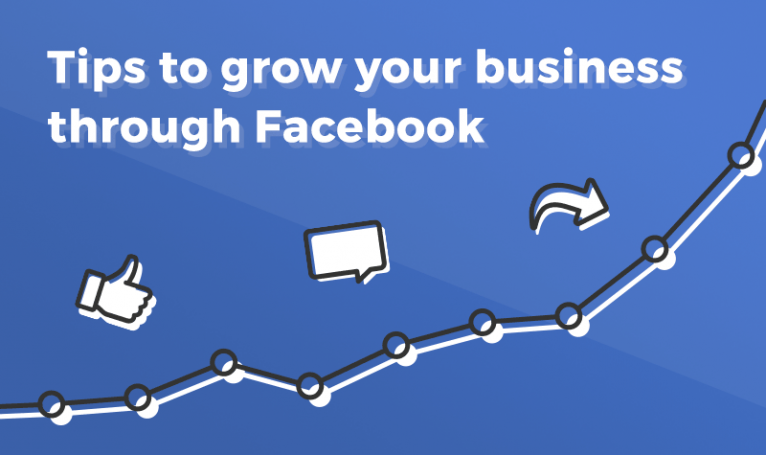 It can be hard to get the reach and engagement you aim on Facebook, but you will get there by trying new techniques and by always being consistent. If trying all those tips at once seems overwhelming, implement one or two first and track the results you get from them. Keep track of the number but value the connection with your fans more. Never implement a strategy that will annoy your fans and keep on interacting with them!